Guglielmo Marconi, 1st Marquis of Marconi (Italian: [ɡuʎˈʎɛlmo marˈkoːni]; 25 April 1874 – 20 July 1937) was an Italian inventor and electrical engineer, known for his pioneering work on long-distance radio transmission, development of Marconi's law, and a radio telegraph system. He is credited as the inventor of radio, and he shared the 1909 Nobel Prize in Physics with Karl Ferdinand Braun "in recognition of their contributions to the development of wireless telegraphy". Marconi did not attend school as a child and did not go on to formal higher education. Instead, he learned chemistry, math, and physics at home from a series of private tutors hired by his parents. His family hired additional tutors for Guglielmo in the winter when they would leave Bologna for the warmer climate of Tuscany or Florence. Marconi noted an important mentor was professor Vincenzo Rosa, a high school physics teacher in Livorno. Rosa taught the 17-year-old Marconi the basics of physical phenomena as well as new theories on electricity. At the age of 18 back in Bologna Marconi became acquainted with University of Bologna physicist Augusto Righi, who had done research on Heinrich Hertz's work. Righi permitted Marconi to attend lectures at the university and also to use the University's laboratory and library. British Post Office engineers inspect Marconi's radio equipment during a demonstration on Flat Holm Island, 13 May 1897. The transmitter is at centre, the coherer receiver below it, and the pole supporting the wire antenna is visible at top. 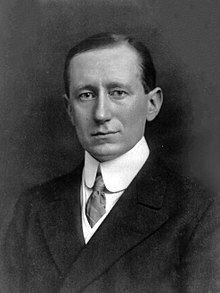 Marconi made the first demonstration of his system for the British government in July 1896. A further series of demonstrations for the British followed, and, by March 1897, Marconi had transmitted Morse code signals over a distance of about 6 kilometres (3.7 mi) across Salisbury Plain. On 13 May 1897, Marconi sent the first ever wireless communication over open sea – a message was transmitted over the Bristol Channel from Flat Holm Island to Lavernock Point in Penarth, a distance of 6 kilometres (3.7 mi). The message read "Are you ready". The transmitting equipment was almost immediately relocated to Brean Down Fort on the Somerset coast, stretching the range to 16 kilometres (9.9 mi). Plaque on the outside of the BT Centre commemorates Marconi's first public transmission of wireless signals. Impressed by these and other demonstrations, Preece introduced Marconi's ongoing work to the general public at two important London lectures: "Telegraphy without Wires", at the Toynbee Hall on 11 December 1896; and "Signalling through Space without Wires", given to the Royal Institution on 4 June 1897. Marconi demonstrating apparatus he used in his first long distance radio transmissions in the 1890s. The transmitter is at right, the receiver with paper tape recorder at left. The role played by Marconi Co. wireless in maritime rescues raised public awareness of the value of radio and brought fame to Marconi, particularly the sinking of the RMS Titanic on 15 April 1912 and the RMS Lusitania on 7 May 1915. On 18 June 1912, Marconi gave evidence to the Court of Inquiry into the loss of Titanic regarding the marine telegraphy's functions and the procedures for emergencies at sea. Britain's postmaster-general summed up, referring to the Titanic disaster: "Those who have been saved, have been saved through one man, Mr. Marconi ... and his marvellous invention." Marconi was offered free passage on Titanic before she sank, but had taken Lusitania three days earlier. As his daughter Degna later explained, he had paperwork to do and preferred the public stenographer aboard that vessel. In 1914, Marconi was made a Senator in the Senate of the Kingdom of Italy and appointed Honorary Knight Grand Cross of the Royal Victorian Order in the UK. During World War I, Italy joined the Allied side of the conflict, and Marconi was placed in charge of the Italian military's radio service. He attained the rank of lieutenant in the Royal Italian Army and of commander in the Regia Marina. In 1929, he was made a marquess by King Victor Emmanuel III. In 1943, Marconi's elegant sailing yacht, the Elettra, was commandeered and re-fitted as a warship by the German Navy. She was sunk by the RAF on 22 January 1944. After the war, the Italian Government tried to retrieve the wreckage, to rebuild the boat, and the wreckage was removed to Italy. Eventually, the idea was abandoned, and the wreckage was cut into pieces which were distributed amongst Italian museums. Marconi was a friend of Charles van Raalte and his wife Florence, the owners of Brownsea Island; and of Margherita, their daughter, and in 1904 he met her friend, Beatrice O'Brien (1882–1976), a daughter of The 14th Baron Inchiquin. On 16 March 1905, Beatrice O'Brien and Marconi were married, and spent their honeymoon on Brownsea Island. They had three daughters, Degna (1908–1998), Gioia (1916–1996), and Lucia (born and died 1906), and a son, Giulio, 2nd Marchese Marconi (1910–1971). In 1913, the Marconis returned to Italy and became part of Rome society. Beatrice served as a lady-in-waiting to Queen Elena. At Marconi's request, his marriage to Beatrice was annulled on 27 April 1927, so he could remarry. 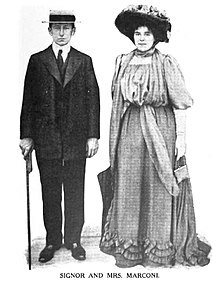 Marconi and Beatrice had divorced on 12 February 1924 in the free city of Rijeka. Marconi went on to marry Maria Cristina Bezzi-Scali (1900–1994), the only daughter of Francesco, Count Bezzi-Scali. To do this he had to be confirmed in the Catholic faith and became a devout member of the Church. He was baptised Catholic but had been brought up as a member of the Anglican Church. On 12 June 1927 Marconi married Maria Cristina in a civil service, with a religious ceremony performed on 15 June. They had one daughter, Maria Elettra Elena Anna (born 1930), who married Prince Carlo Giovannelli (1942–2016) in 1966; they later divorced. For unexplained reasons, Marconi left his entire fortune to his second wife and their only child, and nothing to the children of his first marriage. ^ Bondyopadhyay, Prebir K. (1995). "Guglielmo Marconi – The father of long distance radio communication – An engineer's tribute". 25th European Microwave Conference, 1995. p. 879. doi:10.1109/EUMA.1995.337090. ^ Bondyopadhyay, P.K. (1998). "Sir J.C. Bose diode detector received Marconi's first transatlantic wireless signal of December 1901 (the 'Italian Navy Coherer' Scandal Revisited)". Proceedings of the IEEE. 86: 259. doi:10.1109/5.658778. ^ Roy, Amit (8 December 2008). "Cambridge 'pioneer' honour for Bose". The Telegraph. Kolkota. Retrieved 10 June 2010. ^ a b c Icons of Invention: The Makers of the Modern World from Gutenberg to Gates. ABC-CLIO. 2009. p. 162. ISBN 978-0-313-34743-6. ^ Mulvihill, Mary (2003). Ingenious Ireland: A County-by-County Exploration of the Mysteries and Marvels of the Ingenious Irish. Simon and Schuster. p. 313. ISBN 978-0-684-02094-5. ^ Atti della Accademia di scienze, lettere e arti di Palermo: Scienze, Presso l'accademia, 1974, p. 11. ^ Sexton, Michael (2005) Marconi: the Irish connection. Four Courts Press. ^ Alfonso, not Guglielmo, was a pupil at Bedford School: 'It is not generally known that the Marconi family at one time lived in Bedford, in the house on Bromham Road on the western corner of Ashburnham Road, and that the elder brother of the renowned Marchese Marconi attended this School for four years.' The Ousel, June 1936, p. 78. From Alfonso's obituary. ^ McHenry, Robert, ed. (1993). "Guglielmo Marconi". Encyclopædia Britannica. ^ Guglielmo Marconi (Fabrizio Bònoli, Giorgio Dragoni). Scienzagiovane.unibo.it. Retrieved on 10 June 2016. ^ "22. Word Origins". earlyradiohistory.us. ^ Guglielmo Marconi, padre della radio. Radiomarconi.com. Retrieved on 12 July 2012. 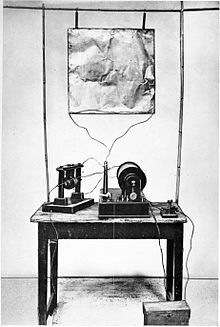 ^ Marconi delineated his 1895 apparatus in his Nobel Award speech. See: Marconi, "Wireless Telegraphic Communication: Nobel Lecture, 11 December 1909." Nobel Lectures. Physics 1901–1921. Amsterdam: Elsevier Publishing Company, 1967: 196–222. p. 198. ^ Marconi, "Wireless Telegraphic Communication: Nobel Lecture, 11 December 1909." Nobel Lectures. Physics 1901–1921. Amsterdam: Elsevier Publishing Company, 1967: 196–222. p. 206. ^ The Saturday review of politics, literature, science and art, Volume 93. "THE INVENTOR OF WIRELESS TELEGRAPHY: A REPLY. To the Editor of the Saturday Review" Guglielmo Marconi and "WIRELESS TELEGRAPHY: A REJOINDER. To the Editor of the Saturday Review," Silvanus P. Thompson. ^ Gualandi, Lodovico (26 June 2000). "MARCONI E LO STRAVOLGIMENTO DELLA VERITÀ STORICA SULLA SUA OPERA". radiomarconi.com. ^ Proceedings of the Institution of Electrical Engineers, Volume 28 By Institution of Electrical Engineers. p. 294. ^ "Marconi's Wireless Telegraph by Cleveland Moffett, McClure's Magazine, June 1899, pages 99-112. ^ Helgesen, Henry N. "Wireless Goes to Sea: Marconi's Radio and SS Ponce". Sea History (Spring 2008): 122. 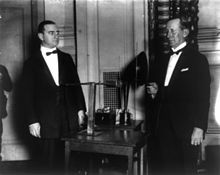 ^ "Marconi and the History of Radio". IEEE Antennas and Propagation Magazine. 46 (2): 130. 2004. doi:10.1109/MAP.2004.1305565. ^ Belrose, John S. (5 September 1995) "Fessenden and Marconi: Their Differing Technologies and Transatlantic Experiments During the First Decade of this Century". International Conference on 100 Years of Radio. ^ a b Eaton, John P. and Haas, Charles A. (1994) Titanic – Triumph and Tragedy, A Chronicle in Words and Pictures. ISBN 0857330241. ^ "Titanic's Wireless Connection". Wireless History Foundation. April 2012. Retrieved 7 October 2013. ^ Daugherty, Greg (March 2012). "Seven Famous People Who Missed the Titanic". Smithsonian Magazine. ^ a b "Radio falls silent for death of Marconi". Theguardian.com. Retrieved on 10 June 2016. ^ a b Redouté, Jean-Michel; Steyaert, Michiel (2009). EMC of Analog Integrated Circuits. Springer Science & Business Media. p. 3. ISBN 978-90-481-3230-0. ^ Meadow, Charles T. (2002). Making Connections: Communication through the Ages. Scarecrow Press. p. 193. ISBN 978-1-4617-0691-5. ^ White, Thomas H. (1 November 2012). "Nikola Tesla: The Guy Who DIDN'T "Invent Radio". Earlyradiohistory.us. ^ Sobot, Robert (2012). Wireless Communication Electronics: Introduction to RF Circuits and Design Techniques. Springer Science & Business Media. p. 4. ISBN 978-1-4614-1116-1. ^ Padfield, Mark. "Beatrice O'Brien". Marconi Calling. Archived from the original on 24 June 2013. Retrieved 24 May 2013. ^ Marconi, Degna (2001) My Father, Marconi. Guernica Editions. pp. 218–227. ISBN 1550711512. ^ Marconi, Maria Cristina (2001) Marconi My Beloved. Branden Books. pp. 19–24. ISBN 978-0-937832-39-4. ^ Degna Marconi (2001), My Father, Marconi (Guernica Editions), p. 232. ISBN 1550711512. ^ "80 Years of Vatican Radio, Pope Pius XI and Marconi. .. and Father Jozef Murgas?". Saint Benedict Center. ^ "Signor Marconi". The Times (36878). London. 20 September 1902. p. 5. ^ "Pioneer: Guglielmo Marconi". radiohof.org. Archived from the original on 5 May 2012. Retrieved 30 May 2012. ^ Italy 2,000 lira banknote (1990) Banknote Museum (banknote.ws). Retrieved on 17 March 2013. ^ "Milestones:Marconi's Early Wireless Experiments, 1895". IEEE Global History Network. IEEE. Retrieved 29 July 2011. ^ "List of IEEE Milestones". IEEE Global History Network. IEEE. Retrieved 29 July 2011. ^ UK | England | Berkshire | Marconi archives move to Oxford. BBC News (6 December 2004). Retrieved on 2016-06-10. ^ a b "CMC Electronics' Profile". CMC Electronics Inc. Retrieved 12 January 2007. ^ "Chatham Marconi Maritime Center". www.arrl.org. Retrieved 9 November 2015. Hong, Sungook (2001). Wireless: From Marconi's Black-Box to the Audion (PDF). Cambridge, Mass. : MIT Press. ISBN 0-262-08298-5. "Marconi, Guglielmo" . Encyclopædia Britannica (12th ed.). 1922.